This booking option will only be available when Room #1, 2, & 3 are occupied! 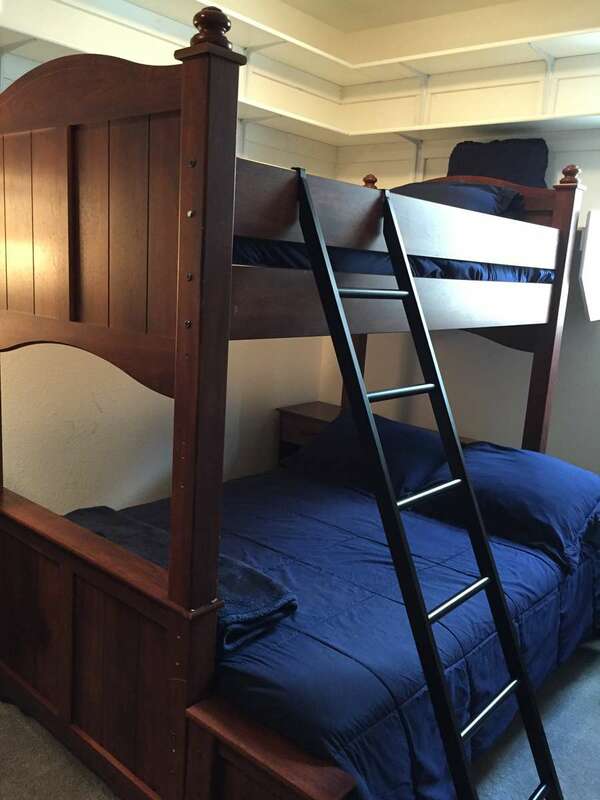 This semi-private room has three twin beds, two of which are set up as a bunk bed. There is a chest-of-drawers and plenty of shelf space. The room is located upstairs and must pass-through the master suite within a shared common area. Step out onto the balcony room for 3-way views of the Las Vegas Valley, Frenchman’s Mountain range, and Calico Ridge. A shared full bath is adjacently located. A private full bath with glass-enclosed granite shower and separate supersized sunken tub feature a picture window (one-way mirror glass) overlooking the golf course and mountain vistas. A separate toilet room is located within the master bath and separate sink vanities flank either side of the room. Ceiling track privacy curtains can be pulled to separate the sleeping and bath areas. The semi-private Triple Twin room #4 can be shared with 1-2 others. Ideal for a family or group; if you are not part of a group and are interested in booking a single bed, please inquire about the gender-specific shared room options currently available. A maximum of three people can stay in this room. Room amenities include TV with cable inside the sleeping room. Base pricing for this room applies the same rate for each individual. Residence front door has a wireless keypad with individual guest access codes assigned upon arrival. All room guests will have access to all of the common areas located on the first floor of the residence. This includes access to a full kitchen to choose from a selection of host-provided whole foods to prepare your own meals. A common area is available for guests to use with multiple tables, an area with couches and a TV with a DVD player, cable television, and free Wi-Fi. A laundry room is available as well so guests are able to do their laundry during their visit. Outside is a large patio area with a gas grill and stone deck raised to view the Vegas Valley and Las Vegas Strip. The backyard allows gated access to a quarter-mile scenic paved trail overlooking the golf course within the private community.